Should you consume soy products? 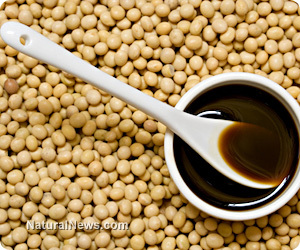 (NaturalNews) Prior to the 1920s, soy was not even considered a food product in the US and was thought to be unfit for human consumption. After 1950, the cultivation of soybeans in the US rose to over 140 billion pounds per year. Over 90% of soy grown in the United States is genetically modified (GM). Most soy consumption is anything but healthy and has strongly contributed to many different health problems. Processed soy contains high amounts of glutamate, manganese, fluoride and aluminum along with toxic processing chemicals. Studies have proven that the heavy consumption of GM soy has increased food allergies and resistance to antibiotics, lowered thyroid function, increased risk of dementia, impaired our immune systems and contributed to cancer formation. 1) Phytic acids: These reduce micronutrient assimilation and are found in all legumes, nuts and seeds. Soy is particularly high in phytic acids that bind to zinc, magnesium, calcium, copper and iron in the digestive tract. High consumption leads to nutrient deficiencies and chronic disease development. 2) Trypsin inhibitors: These block protein absorption and enzyme production and utilization within the body. The lack of enzymes creates more digestive stress which leads to intestinal permeability. Intestinal permeability causes antibody formation to normal food stuffs and leads to chronic inflammation and auto-immune disease progression. 3) Goitrogens: These interfere with iodine metabolism, block the formation of thyroid hormones and can lead to hypothyroidism. Soy formula consumption has been linked with auto-immune thyroid disorders. 4) Phytoestrogens and isoflavones: These are plant compounds that resemble human-produced estrogen and disrupt normal hormone production in the body. High amounts of phytoestrogens are linked with infertility and certain cancers in both men and women. 5) Hemagglutinin: This is a type of complex protein in the family of lectins that affects other proteins and causes them to stick together. Hemagglutinin has a particular affinity for red blood cells and causes them to clump up, which slows blood flow and oxygen extraction into the cells. These compounds are found in high amounts within processed soy products such as soy milk, soy protein, soy-based infant formulas, soy burgers and cheeses, soy sauces and soybean oil. There are many additional issues other than the five listed above with processed soy that relate to all processed foods. Processed soy is also most likely going to be genetically modified and loaded with toxic debris. Many health enthusiasts have strongly recommended more natural forms of raw, unprocessed soy such as tofu and edamame. These are certainly better than highly processed soy, but both contain all of the harmful compounds listed above. The only tolerable soy is deeply fermented soy in the form of tamari sauce, miso, natto and tempeh. The deep fermentation process removes the antinutrients and phytic acids, deactivates enzyme inhibitors and hemagglutinin, and breaks down many of the harmful proteins and plant compounds into a more tolerable form for the body. These products contain complete protein that is easy to digest as well as B vitamins, enzymes, probiotics, vitamin K2 and key trace minerals. Avoid all soy products except for the deeply fermented varieties listed above. If you are a vegan and refrain from all animal products, then the addition of fermented soy is key to good health. If you consume organic and pasture-raised animal products more than twice a week, then there is no need for any form of soy in your diet, as you will be able to get all your essential nutrients without the soy.